Uprisings in Arab States, Birth of Islamic Middle-East? 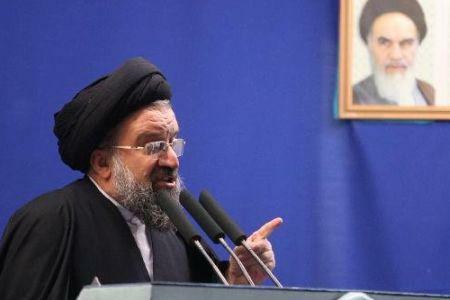 TEHRAN (FNA)- Tehran’s provisional Friday Prayers Leader Ayatollah Ahmad Khatami said the popular uprisings in Tunisia, Egypt, Jordan and Yemen signify creation of an Islamic Middle-East. “Incidents that are happening in the Middle-East and the Arab world should not be regarded simply,” Ayatollah Khatami said, addressing a large and fervent congregation of people on Tehran University campus. “To those who do not see the realities I clarify that an Islamic Middle-East is being created based on Islam, religion, and democracy with prevailing religious principals,” Ayatollah Khatami stressed. He was referring to the recent historic revolution in Tunisia and massive protests in Egypt, Jordan, and Yemen. Egypt’s largest opposition group the Muslim Brotherhood on Thursday called on the country’s people to continue protests. Muslim Brotherhood spokesman Essam al-Arian warned that Egypt would “explode” if the government does not listen to the people. Meantime, Police clamped down on anti-government protesters in the Egyptian capital of Cairo on Friday. A small gathering of Egyptian anti-government activists tried to stage a second day of protests in Cairo Wednesday in defiance of a ban on any gatherings, but police quickly moved in and used force to disperse the group. The Internet and cell-phone data service appeared to be cut across Egypt on Friday as authorities braced for demonstrations backed by both the country’s biggest opposition group and newly returned Nobel Peace laureate Mohamed ElBaradei. Unconfirmed reports circulated early Friday on Twitter that police were splashing gas around key squares ready to set them alight when protesters approached. The Muslim Brotherhood said at least five of its leaders and five former members of parliament had been arrested. The group’s lawyer, Abdel-Moneim Abdel-Maksoud, and spokesman, Walid Shalaby, said a large number of rank-and-file Brotherhood members also had been detained. Egypt’s four primary Internet providers — Link Egypt, Vodafone/Raya, Telecom Egypt, Etisalat Misr — all stopped moving data in and out of the country at 12:34 a.m., according to a network security firm monitoring the traffic. Telecom experts said Egyptian authorities could have engineered the cutoff with a simple change to the instructions for the companies’ networking equipment. The Internet appeared to remain cut off Friday morning, and cell-phone text and Blackberry Messenger services were all cut or operating sporadically in what appeared to be a move by authorities to disrupt the organization of demonstrations. The developments were a sign that President Hosni Mubarak’s regime is toughening its crackdown following the biggest protests in years against his nearly 30-year rule. The real test for the protest movement will be whether Egypt’s fragmented opposition can come together, with Friday’s rallies expected to be some of the biggest so far. The movement’s momentum appeared to gather Thursday with the return of Nobel Peace laureate Mohamed ElBaradei and the backing of the Muslim Brotherhood. The United States, Mubarak’s main Western backer, has been publicly counseling reform and an end to the use of violence against protesters, signs the Egyptian leader may no longer be enjoying Washington’s full backing. In an interview broadcast live on YouTube, President Barack Obama said the anti-government protests filling the streets show the frustrations of Egypt’s citizens. “It is very important that people have mechanisms in order to express their grievances,” Obama said. The Brotherhood has sought to depict itself as a force pushing for democratic change in Egypt’s authoritarian system, and is trying to shed an image among critics that it aims to seize power and impose Islamic law. The group was involved in political violence for decades until it renounced violence in the 1970s. ElBaradei, the former head of the U.N. nuclear watchdog and a leading Mubarak opponent, has sought to recreate himself as a pro-democracy campaigner in his homeland. He is viewed by some supporters as a figure capable of uniting the country’s fractious opposition and providing the movement with a road map for the future. Once on Egyptian soil, he struck a conciliatory note. “We’re still reaching out to the regime to work with them for the process of change. Every Egyptian doesn’t want to see the country going into violence,” he said. Its comments were likely to reinforce the belief held by many protesters that Mubarak’s regime is incapable, or unwilling, to introduce reforms that will meet their demands. That could give opposition parties an opening to win popular support if they close ranks and promise changes sought by the youths at the forefront of the unrest. Tunisian-style protests erupted in Yemen over the weekend with thousands demanding the downfall of its autocratic president who has joined leaders from Algeria to Jordan in the crosshairs of a regional revolt. Pressure for regime change in the stagnant Arab dictatorships has shifted across the Middle East and North Africa since Tunisia’s Zine El-Abidine Ben Ali fled in the face of demonstrations in Tunis on January 14. Yemen police on Sunday arrested Tawakel Karman, a female Islamic activist, who had organised the 2,500-strong demonstration in the grounds of the University of Sanaa. A heavy police presence and an active role by the secret police thwarted attempts to move the demonstration to the streets of the capital. 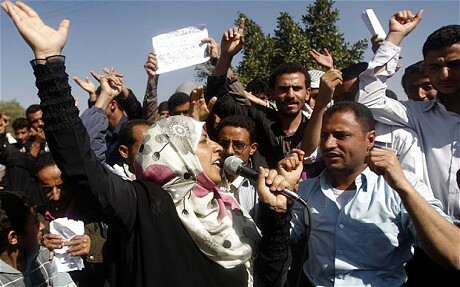 CAIRO: Clashes broke out in Algeria as opposition groups defied a government decision on Friday. Police cracked down on a pro-democracy demonstration in the Algerian capital on Saturday leaving several people injured, the leader of an opposition party that organized the rally told AFP. “There are several injured… and numerous arrests,” Said Sadi, the head of the Rally for Culture and Democracy (RCD), said. Among those arrested was the head of the party’s parliamentary group, Othmane Amazouz. The government had warned people not to show support for the demonstration in a statement issued on the eve of the march, amid fears of popular unrest spreading from neighboring Tunisia…. About 1,400 people demonstrated in other parts of Jordan, mainly the northern cities of Zarqa and Irbid…. On the same day, thousands protested in southern Yemen to reject political reforms proposed by the government, including a limit on presidential terms, saying they did not go far enough. The pan-Arab newspaper Asharq Al-Awsat reported that an unemployed Yemeni youth set himself on fire in the southern province of Baidah on Wednesday, following the example of the young vegetable seller whose self-immolation inspired revolt in Tunisia and copycat acts in Egypt, Algeria and Mauritania. Less than 24 hours after the breakdown of its nuclear dialogue with the six world powers in Istanbul, Iran announced plans Sunday, Jan. 23, to send a fleet of warships, including a home-made destroyer, on operational and intelligence-gathering missions to the Red Sea and on to the Mediterranean through the Suez Canal. Debkafile’s military sources: Parts of the fleet will in fact be deployed in the three waters around Israel’s southern and western shores. Tehran is taking advantage of the lack of military and diplomatic momentum on the part of US and Israel for a naval thrust to expand its range of operations and encroach on their areas of control. It is also a rapid response to the arrival of the USS Enterprise carrier with a strike group carrying 6,000 sailors and marines and 80 warplanes in the Mediterranean at the end of last week on its way to the Arabian Sea opposite Iran. British ex-Prime Minister Tony Blair’s call on the West to stop apologizing and react to Iran with force was not lost on the rulers of the Islamic Republic. 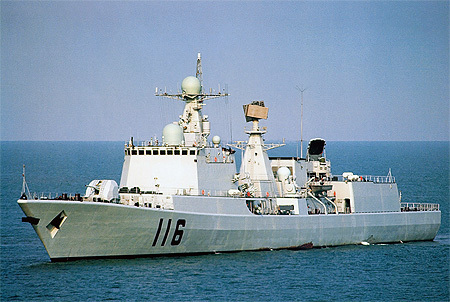 The Navy Commander, Rear Admiral Habibollah Sayyari spoke of three or four vessels including Iran’s first home-made destroyer, Jamaran, with back-up operational units standing by for urgent support missions. His deputy, Rear-Admiral Gholam Reza Bi-Gham said the deployment would last about a year and at some future time, long-distance submarines would join the fleet. Since Nov. 2008, the Iranian Navy has been conducting anti-piracy patrols between the Gulf of Aden Straits of Bab al-Mandeb off Yemen so some of its units are not far away. Both admirals reported that a flotilla of Iranian naval officer cadets would soon be dispatched to the Mediterranean and Red Seas to gain experience in these new areas and gather intelligence. Iran recently purchased three Kilo class submarines from Russia and is using them in the Persian Gulf. Debkafile’s military sources report they belong to a bygone generation of subs and lack advanced electronic systems, making it hard for them to stay deep down underwater for long periods without surfacing. For two years, Iranian military shipyards have been building miniature submarines, war ships and fast assault craft. Most Western naval give them low ratings in performance especially in view of their outdated electronics. Debkafile’s military sources, however, estimate that if deployed in support of the warships assigned to the Mediterranean and Red Seas, those mini-submarines and assault craft could be extremely troublesome and give plenty of headaches to American, Israel and Egyptian naval commanders. 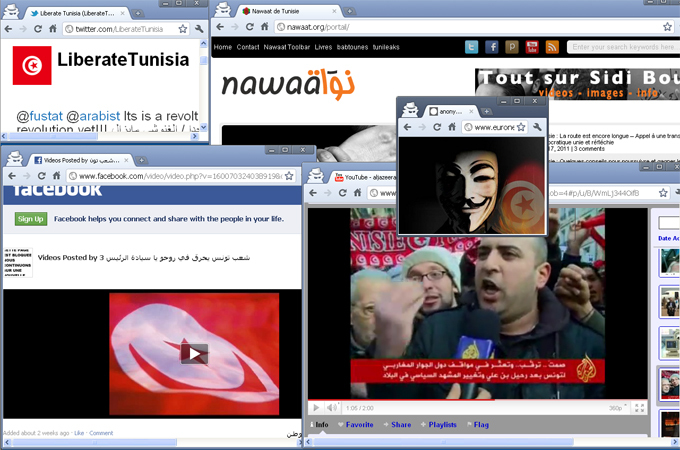 Tunisia: A media led revolution? Are we witnessing the birth of the second republic fueled by social media? Contrary to civil unrests in Tunisia during the last few years, the dramatic death of 26 year old university graduate Mohamed Bouazizi sparked off angry protests in many parts of the country and have attracted international media attention thanks to social media networks. The dramatic events have escalated into more riots in Bizerte, Jandouba, Gasserine, Baja, Sfax, Nabeul, Hammamet, and even in the capital Tunis, among other towns and cities. This emergency situation has compelled the government to say that they will swiftly kick-start development projects, namely in the southern deprived areas of the country. Faced with even more growing unrest (and in a latest move) the president promised to open up freedom of expression in the media, to free up political life, to bring to justice corrupt politicians and above all free the media and remove all restrictions on the internet. Yet all these measure came in the eleventh hour. The mounting pressure, which turned into a revolution, has forced the president to flee the country. In light of the dramatic development of events, on a considerable scale, it has become evident that new media have been playing a key role this time around in keeping the momentum going, and bringing the voices of the disengaged Tunisian youth to the attention of world media, and hence to international public opinion. Mobile phones, blogs, YouTube, Facebook pages and Twitter feeds have become instrumental in mediating the live coverage of protests and speeches, as well as police brutality in dispersing demonstrations. The internet in this case has assumed the role of a very effective uncensored news agency from which every broadcaster and news corporation have been able to freely source newsfeeds, raw from the scene. Such developments have proven very significant in changing the rules of the game, of journalism production and dissemination of information in a country where the government historically keeps tight control on the media and where almost no platform is available for opinions critical of the political elite. Article 1 of the Press Code in Tunisia provides for “freedom of the press, publishing, printing, distributing and sale of books and publications”. The Tunisian constitution asserts that the “liberties of opinion, expression, the press, publication, assembly, and association are guaranteed and exercised within the conditions defined by the law”. Yet as early as 1956, with the birth of the first republic under the leadership of President Habib Bourguiba, the ruling government gained control over the press – and later over broadcasting. As a result almost all the media outlets remained propaganda tools in the hands of Bourguiba’s government and ruling party. Be sure to read the rest of this fascinating, informative article! With the upcoming vote in South Sudan on whether to split off and create their own country, I am watching the news with much interest. This is the largest country in Africa. Follow the money. 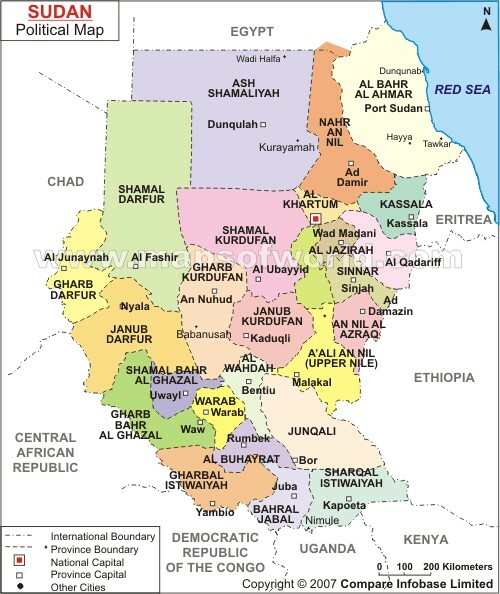 The wealth of that country is in the oil wells located in what may soon become part of the new South Sudan… if the North allows it, that is. We’ll see. 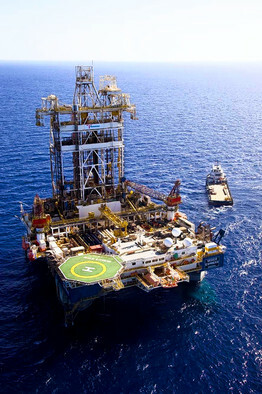 Image: Natural gas rig off the coast of Haifa, Israel. Photo credit: Noble Energy. “… a trail of prophetic clues found in the Hebrew Scriptures that some believe (myself included) indicate that in the “last days” the nation of Israel will be blessed by discovering huge reserves of petroleum that will make Israel quite wealthy. The discovery of the largest gasfield in the eastern Mediterranean set off a frenzy yesterday in Israel, which has long depended on imported energy. The Leviathan field, estimated to hold 16 trillion cubic feet (tcf) of gas worth more than US$95 billion (Dh348.93bn), was discovered by Noble Energy and its partners 130km offshore from Haifa, the northern Israeli port. The discovery will “impact many fields in Israel,” Uzi Landau, Israel’s infrastructure minister, said after the announcement.The discovery is almost three times as large as the nearby Tamar gasfield that a group led by Noble struck two years ago. The twin Tamar and Leviathan discoveries mean Israel has more than enough gas to fuel its power stations for decades. It currently depends on Egypt for much of its gas supply. Israel’s gas find has sparked a trading frenzy in Tel Aviv and New York. The shekel gained as much as 0.8 percent to 3.5432 per dollar, the highest level since October 2008. Shares of local oil and gas companies have shot up this year, but many pulled back yesterday as investors realised that the path to bringing Leviathan’s gas on stream might not be smooth. One factor is that Noble, based in the US, and its Israeli partners, Delek Energy, Avner Oil Exploration and Ratio Oil Exploration, are nervous about the deteriorating environment for oil and gas investment in Israel. “Realising the potential of Leviathan requires from the developers enormous investment in infrastructure to export gas,” said Gideon Tadmor, the chief executive of Delek Energy, a unit of Delek Group. Yoram Turbowitz, the group’s chief executive, told Israel’s Haaretz newspaper he was experiencing “a sense of success mixed with worry and concern that we will not be able to utilise the huge discovery … to its limits”. “[It] will demand enormous investment in infrastructure. The state will need to assist with regulations, planning and accompanying what will become the largest infrastructure project in the country,” he added…. At least part of the 325 square kilometres covered by the Leviathan field lies within waters contested between Israel and Lebanon. The two neighbours do not have diplomatic relations and their maritime border has not been formally demarcated. Beirut stated this year that part of the Leviathan prospect lay within Lebanese territory. In August, Lebanon’s government passed the country’s first oil exploration law. Gibran Bassil, the oil minister, said the first auction of offshore exploration licences could be held just over a year from now. The border disputes may not stop there. This month, Israel and Cyprus reached an accord on their border that was promptly rejected by Turkey.